Saimah (second row, first right) with her restaurant crew and family members. BINTULU: Kampung Seberang Kuala Tatau, Bintulu is very well known for its ‘udang galah’ (giant freshwater prawn) and ‘ikan duai hitam’ (black pomfret fish). 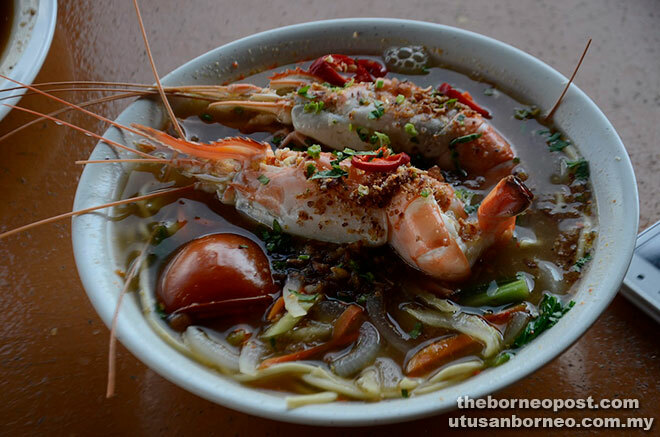 D’Muara Seafood owner Saimah Suli who is from the village said that her eatery mainly served seafood dishes and traditional Melanau cuisine but the dish that is most sought after is the ‘mee udang galah’ or giant freshwater prawn noodles. 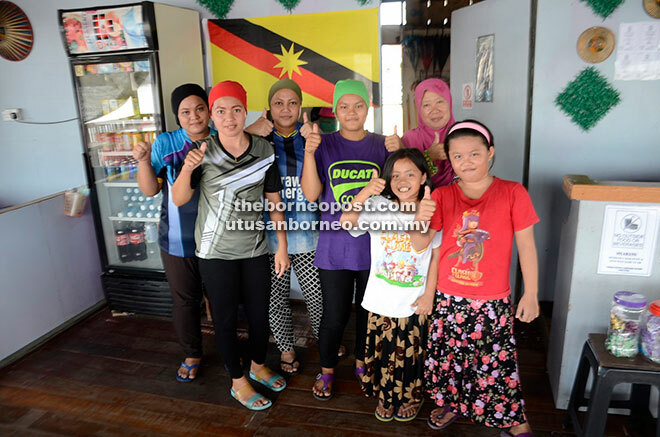 “My customers love my tomyam-flavoured giant freshwater prawn noodles and they come from as far as Bintulu town to savour the succulent prawns,” she told Borneo Post Adventure Team (BAT) 7 yesterday. “Most of my regular customers come on Saturday and Sunday to patronise my eatery and that is when my business is at its busiest,” she added. Saimah, 46, started her eatery some two years after she decided to venture into the food business and she is very happy that it has attracted many weekenders and those who love seafood. “Last time, I used to be in the dried seafood business but decided to try my luck in operating an eatery and had the blessings from my family,” she revealed. 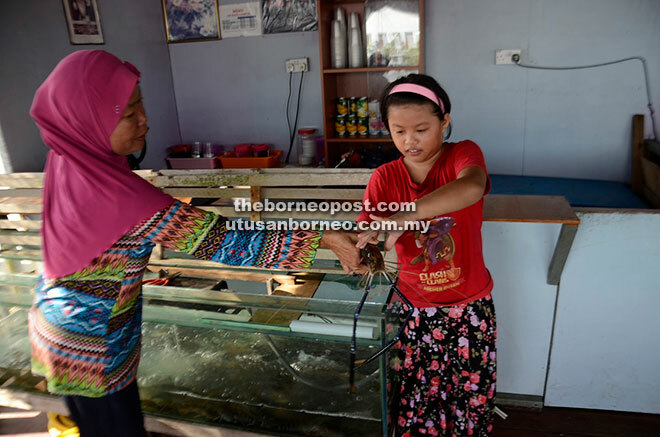 Saimah (left) handing a giant freshwater prawn for the cooking pot to her daughter Nurfarizah Azianni Hafizuddin. Saimah said she got her supply of fresh prawns and seafood from local fishermen who net their catches from Kuala Tatau River and the South China Sea. 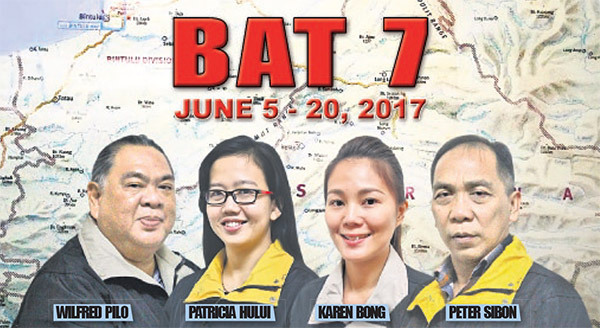 BAT7 also had the chance to taste ‘ikan duai hitam’ dishes which Kuala Tatau is also well-known for, according to Saimah. Tantalising giant freshwater prawn noodles. The prawn noodles were priced from between RM4 to RM10 per bowl (soup or gravy style) or per plate (dry noodle style). BAT7 earlier met Kisnadey Azemi at the village who worked for the Bintulu Rural Water Supply Department at Surau Nur Iman. He said he is also the zakat collector or ‘amil’ for the Muslim community in the village and has been married to a local there for 16 years. Kisnadey who is from Kampung Jepak, Bintulu revealed that there are three other villages surrounding the Kuala Tatau area, namely Kampung Haji Ismail, Kampung Hilir and a newer village called Kampung Seberang Jaya. “The smallest is Kampung Seberang Jaya which was established in 1940 by migrants from Bintulu during the British colonial period. It now has 46 families and more than 100 people,” he said. A young couple about to savour their prawn dishes at D’ Muara Seafood by the Kuala Tatau River. He added that the most populated areas in Kuala Tatau here are Kampung Haji Ismail and Kampung Hilir, with most of their residents comprising fishermen and farmers. “That is one of the reasons why the Kuala Tatau Bridge is being built to cross the Kuala Tatau River from these two villages besides linking this place to Balingian and Mukah once completed,” he said. Kisnadey said Kuala Tatau Bridge will benefit many people in the area when finished and it will prosper the area.